A combination of circumstances meant that if I was walking last Saturday it would have to be a solo effort - canine company excepted. This led to the usual Friday evening "will I or won't I" internal debate, factoring in such variables as the weather; how early I could be bothered getting up; how far I could be bothered driving; and the likelihood of getting me or the dug shot, given that the stalking season is now upon us. 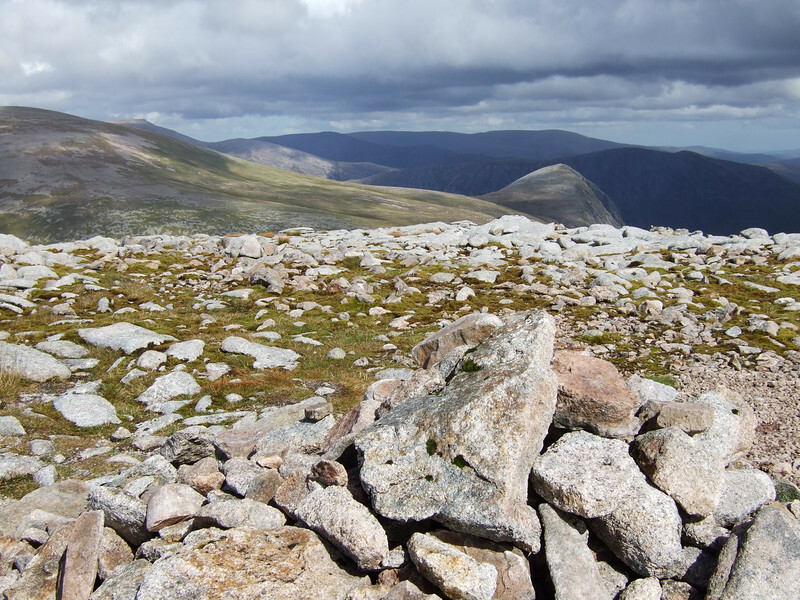 What bubbled to the top of that particular melting pot was the Cairngorms, and Monadh Mor in particular. 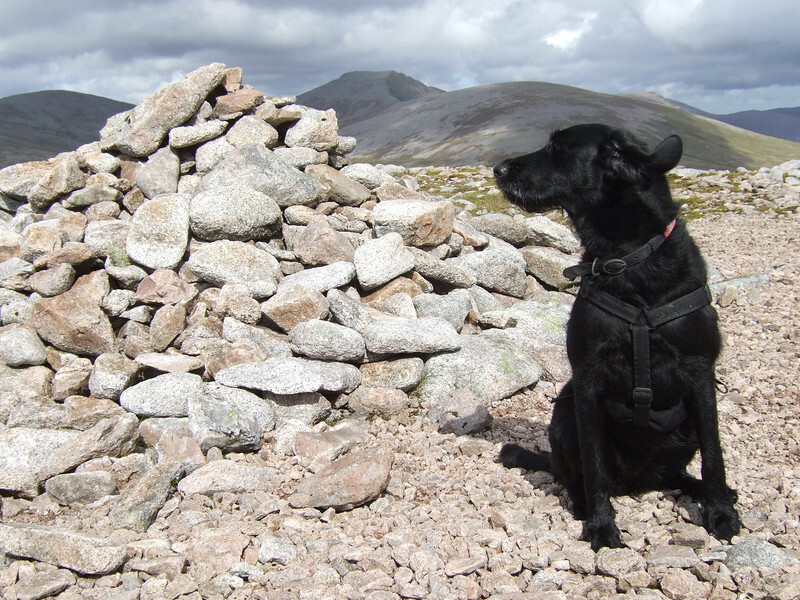 Me and Andy had enjoyed a day out on its neighbour last year, so given I only had a one hill target, it seemed to make sense to approach it from the Glen Feshie side rather than Linn O' Dee, just for a change. 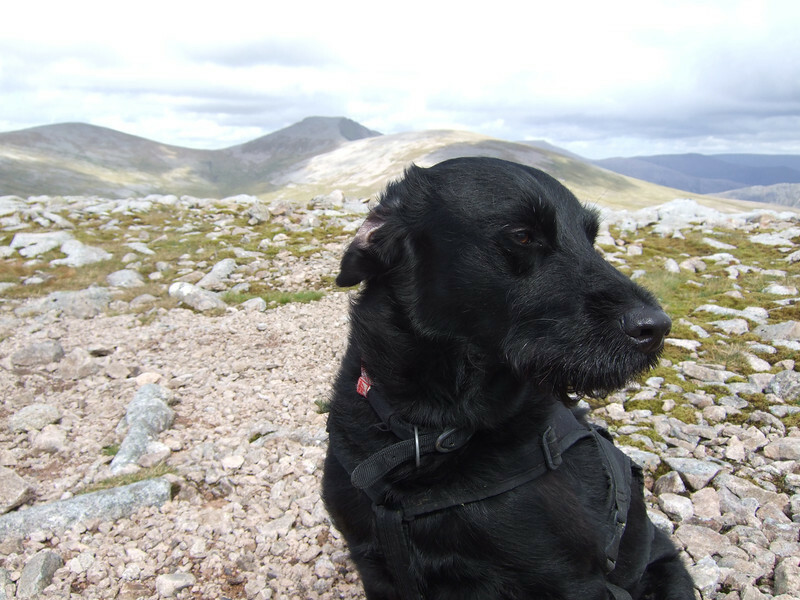 It's about two & three quarter hours from the house to the carpark at Auchlean, which included a ten minute stop at the Newtonmore transport cafe for a roll and bacon for yours truly, and a roll and sausage for the Wee Black Dug. For all I know, that was the highlight of her day. I've been up the Foxhunters path twice before, and it was in reasonable nick then, but clearly not up to the required standard, because they've got the Cooncil in. I don't know quite why, but I was finding the walk incredibly heavy going from the outset. It's not especially steep, and it's fairly consistent, but my legs were rebelling and my lungs were soon threatening to come out in sympathy. I kind of decided that once I got to the top of the path, below Carn Ban Mor, I'd probably have to take a view on whether to curtail the day, and perhaps head over to Sgor Gaoith instead - Jorja's never done that one, so it wouldn't have been a total write off. As it turned out I got my second wind (probably not unconnected with the fact that I started going downhill too) and as the MWIS-promised lack of clouds was beginning to look more likely, the decision was made to boldly press on. There's an unusual feel to this walk, somehow. 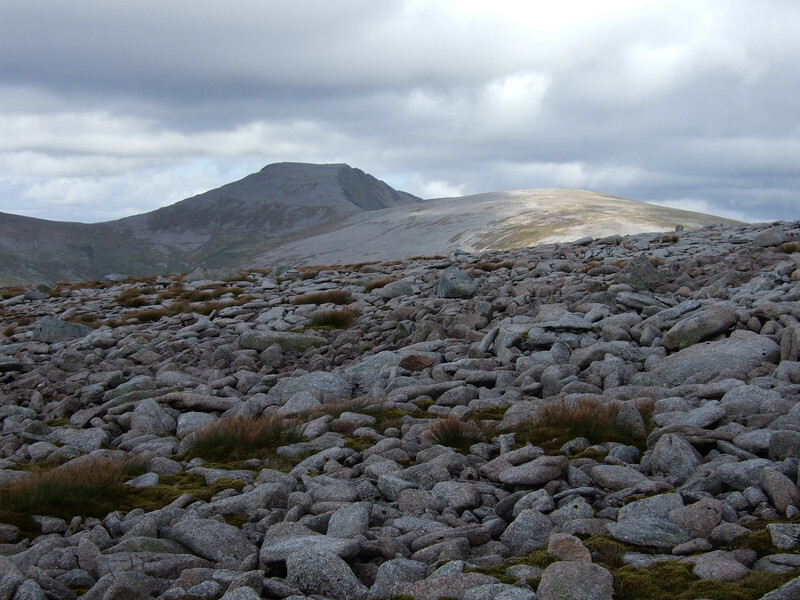 I'd read (in an extract from one of Irvine Butterfield's books) that doing this hill, Beinn Bhrotain, and Carn Cloich-mhuillin from the Glen Feshie end is "perhaps one of the most psychologically intimidating walks in Britain". Now, I was only after one of the three, admittedly, but nevertheless there's definitely a feeling of vulnerability about the route. 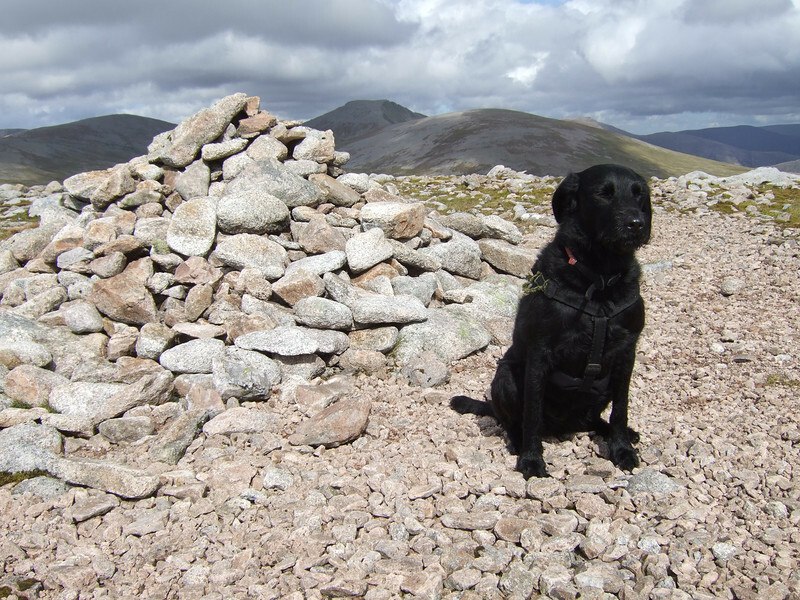 I've had long walk ins before - indeed the approach to Beinn Bhrotain is a trek, and the day we did Cairn Toul et al was another example...but this was different. I was trying to work out why, but the best I can come up with is the effort involved at the outset; in conjunction with the lack of any real sense as to what you're taking on. If you walk in from Linn o' Dee or White Bridge, it's flat, and you can see the hills coming, as it were. You have an hour or more walking towards them, to get used to the size of them, and the scale of things. Going up the Foxhunter's Path you can't really see anything in front of you, other than path. 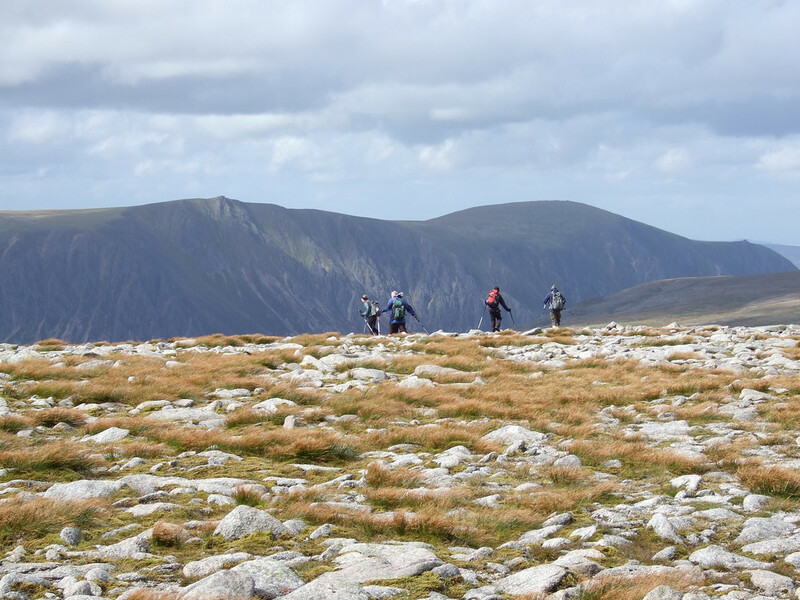 Pretty much all of a sudden, somewhat knackered already, you pop out on the start of the plateau and the vista of the Moine Mhor opens up in front and around you. It's then that you catch your first glimpse of some Really Big Hills that are still Really Far Away - and you realise that you're expected to walk pretty close to them before the day's over. It gives you pause for thought, right enough. There's still a path to follow, which takes you down, and then up, to a junction with a landrover track. 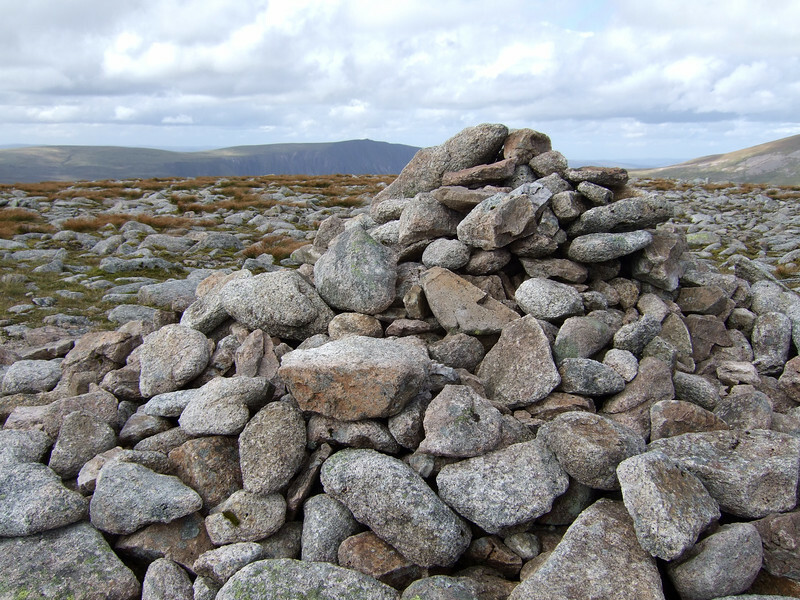 Sgor Gaoith is an impressive shape from just about anywhere on the Moine Mhor. 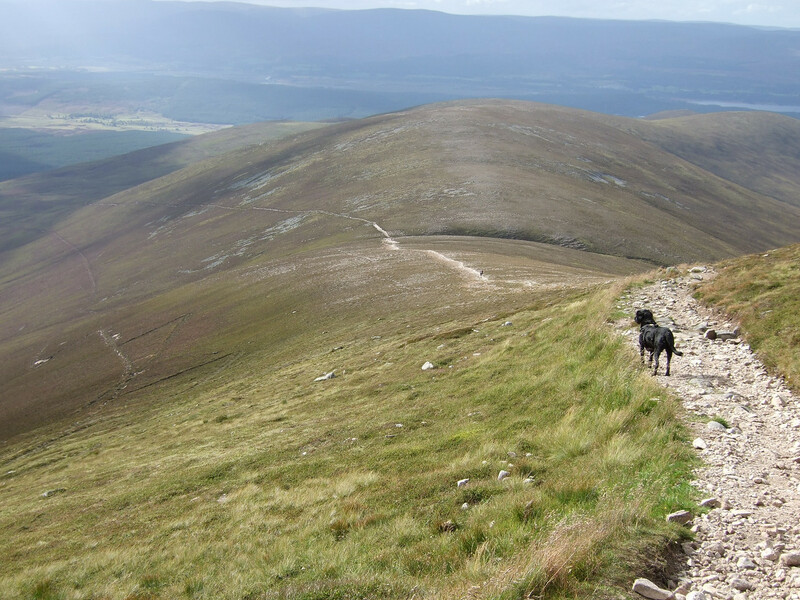 More impressive, certainly, than boring old flat-topped Cairn Toul, which hoves into sight further down that track. The route I chose was still tussocky and wet in places but you could pick a route through it, pretty much staying on slightly higher ground all the way to the Allt Luineag. Everything I had read about the routes up this hill pointed out that this burn was unexpectedly sizeable for somewhere this high up, and cautioned that it can sometimes be tricky to cross. Forewarned is forearmed, as they say. My £2.45 Tesco "Croc-a-likes" were the very dab. It's the first time I've ever adopted that sandal carrying approach, and it was infinitely preferable to the usual "fill yer boots" scenario, or indeed the tense twenty minute windmill armed slippery rock balancing performance that's the general alternative. I aye get wet feet, so why not embrace the fact, allow them to dry, then put your socks and shoes back on? Refreshing, that's what it was. Maybe not a winter tactic though. It was probably around now, flushed with the success of conquering the mighty Allt Luineag, that I realised I was actually going to get to the top of the hill, the initial laboured wheezing up the Foxhunter's Path being a mere memory. It's a straightforward not too steep wander over boulderfields with grassy intervals, and the views keep opening up and up and up. The summit's a place to linger. And after that, all there is to it is the nine miles back to the car. Ach - that wee bit only takes a couple of hours. And the last hour is all downhill. I consider last Saturday fully seized. That's some walk. Glad you got there in the end. I was extremely impressed with the rubber footwear. Matching knitted trunks for the really deep rivers would be another advantage. You might be onto something here. Sounds like a great day out and all the more rewarding no doubt because you kept going. 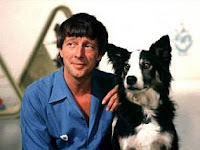 Maybe the wee black dug talked you into it! Now I'm off to Tesco's to pick up that bargain in footwear!! Me in "matching knitted trunks" is one of the few things that could get a blog summarily shut down. Even the internet has its limits. In fairness John, although £2.45 is indeed a bargain, they were only a fiver to begin with, so even if the sales finished it's maybe still worth a punt!